Critical habitat refers to those parts of a cetaceans range, either a whole species or a particular population of that species, that are essential for day-to-day survival, as well as for maintaining a healthy population growth rate. Areas that are regularly used for feeding (including hunting), breeding (all aspects of courtship) and raising calves, as well as, sometimes, migrating, are part of critical habitat, especially if these areas are regularly used. Unlike land-based critical habitat, however, marine critical habitat boundaries may be less fixed, especially in terms of hunting and feeding areas which are dependent on upwelling and other ever changing oceanographic conditions. Baleen whales, for example, are known to feed in and around upwellings, which vary depending on local and large-scale oceanographic conditions to some extent during a season and from year to year. The implication for MPA design is that more flexible definitions of marine protected areas for cetaceans are needed in some cases. This book argues for larger overall biosphere reserve-type areas which would include a number of highly protected 'Core areas' corresponding to cetacean critical habitat with boundaries that can be adjusted as needed from year to year or even within seasons. Such adjustments should be adaptive, constantly reviewed and sensitive to signals from the wider environment. To achieve this fine-grained kind of critical habitat management, it will be necessary to unravel and understand ecosystem processes and the impacts that humans can have on such processes. An appropriate tool for this is ecosystem-based management. Critical habitat for cetaceans is a fairly new idea, yet to be fully explored, much less implemented. In the comprehensive US blueprint for MPAs, 'Critical habitats' are areas such as spawning grounds, nursery grounds, or other areas harboring vulnerable life stages (Commission on Geosciences, Environment, and Resources, 2000). According to this document, The primary consideration for implementing marine reserves should be the needs of each biogeographical region based on protecting critical habitats. It is becoming clear that identifying the critical habitat of cetaceans, the crucial core areas, will be the first step toward good marine management of MPAs with cetaceans. Critical habitat is identified under the US Endangered Species Act of 1973 but, to date, has mainly been applied to land-based endangered species. The Endangered Species Act prohibits federal government agencies from allowing activities that adversely affect critical habitat. Federal permits for fishing, oil and mineral development activities within critical habitat areas must show that critical habitat will not be harmed. Taylor et al (2004) showed that designation of critical habitat under the Endangered Species Act is significantly associated with improving population trends for species listed as endangered. Much research over the next few decades will be focused on defining, locating and understanding the parameters for cetacean critical habitat. Some of these are conventional geographical aspects and others are the more fluid oceanographic parameters such as temperature, salinity and current. 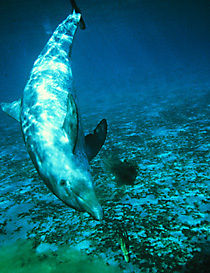 For example, a recent study attempting to quantify cetacean habitat patterns in the California Current using a broad suite of oceanographic data was 48 per cent successful in predicting cetacean presence, ranging from 70 per cent for Dall's porpoises to less than 10 per cent for fin whales (Reilly et al, 1997). As understanding and measurement of the appropriate parameters becomes sharper, this predictive ability should improve. Thus, critical habitat may be defined as not only the fixed and seasonally changing boundaries of the places cetaceans habitually use, but also the less- or non-geographically-based conditions that more precisely define such an area as critical habitat. What we need to do now, adopting a precautionary approach, is to conserve sufficiently large marine areas that include cetacean hot spots as well as the areas that we believe may have such conditions so that we can ensure that the options for future conservation are left open. Excerpt from Hoyt, E. 2005. Marine Protected Areas for Whales, Dolphins and Porpoises: A worldwide handbook for cetacean habitat conservation. Earthscan, London, 516pp. Erich Hoyt 2005, all rights reserved.